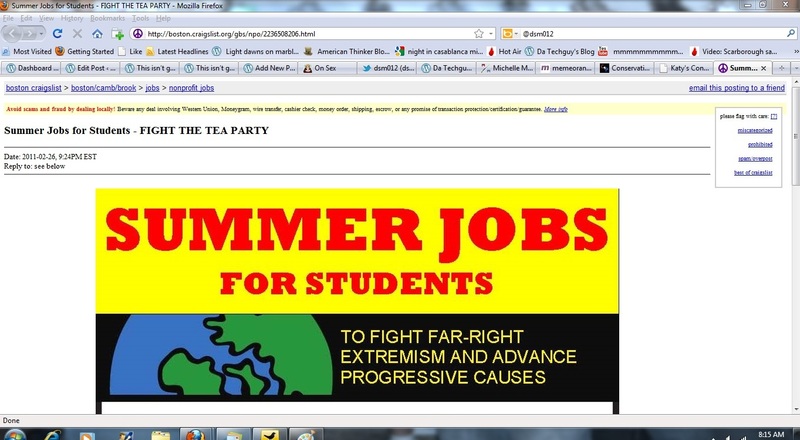 Let’s not forget that the Tea Party is totally paid for and that young people get involved because they care. 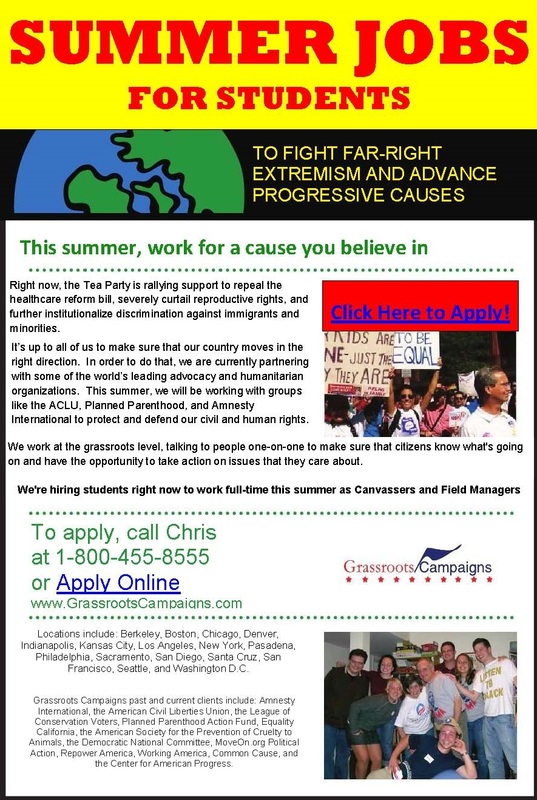 Keep this in mind the next time the left tells you the tea party is not GrassRoots and their support is. …plus guys hope to score. I submit that if a congressman, state rep or MSM reporter came with me for a week door to door; they would not dare advocate the taxes, spending and regulation that they do. Read the whole thing as they say. Save 18.2% And get Show sponsorship! If you have ready-made ads in mp3 format they can be submitted by e-mail as late as Wednesday Evening the week of the show. If I am writing and/or producing your ad then I need confirmation by Tuesday to get your ad written and produced for that week’s show. Also if you own more than one business you can run ads for both and I will give you a price based on their combined time. Ads can be paid for via DaTipJar; simply put ADS in the comment section. Remember AM 830 WCRN Worcester is a 50,000 Watt station broadcasting after dark when other AM stations are powering down for the evening, it might be a good investment not only to push your product or opinion but perhaps a radio show hosted by a blogger with national and local bloggers on the air might boost your blog hit totals. Then again maybe it won’t, it’s not as if the show got an instalanche or something. UPDATE: As of 11/29 The “Show sponsorship rate” is no longer available in December. There simply is not enough ad time left available for it. As you know I love the book Man of the House In it Tip O’Neill tells the story of Mrs. O’Brien during his 1935 race for the Cambridge City Council. The only race he ever lost. When she says to him that she will vote for him even though he didn’t ask. Yesterday after my dentist appointment I was going door to door to business in Leominster promoting the show and trying to sell ads. I was having no luck selling when I noticed a small insignificant looking African variety store with a Ghanian flag on the door. Logic said pass it by after all at best I could hope to sell a $20 ad for a single week, so why bother when Wyman’s Liquor Mart Inc was across the street and Leominster Credit Union was there. But you know I was there and it never hurts to ask. Turned out the man there owns an international shipping company that ships to the gold coast of Africa: Ghana, Liberia, Guinea, Nigeria and when I told him the range of my 50,000 watt radio signal he asked me to come back on Tuesday with Ad samples. If I had ignored that little story I would have lost my best lead of the day. Which brings us to the blog htotherdizzle and Hallie Miller. Hi! My name is Hallie and I have entered a Savvy Magazine photo shoot contest. I know you don’t know me but the winners are chosen by the public and if the public doesn’t know they need to vote…well, you guessed it, no one votes! Could you take a moment and look at my photos and decide if you would vote for me or not? Thanks! Here’s the link, could you pass it along? It had all the classic signs of spam, an icon of a beautiful woman, a link different from the e-mail but I also noticed it was a wordpress blog, and my spam filter didn’t grab it. Intrigued I searched for the name, and did a search for the link and sure enough it goes to a modeling site that is having a contest. I thought of Tip O’Neill’s story and I thought of all the doors I have knocked on in the last few days and realized she is doing the exact same thing I am. She is chasing her dream unafraid to ask a total stranger to help. So Hallie Miller this is my gift to you, I am not only approving your comment, and voting for you but I am linking to your post on the contest and putting up this blog post to let everybody know about it. I hope my readers go to the Explore modeling Site to vote for you. Update: I didn’t include a picture of Hallie Miller because I didn’t have her permission, but I did tell the story to Stacy McCain who is a lot less shy. Oh BTW you can vote once per day. Works for me.